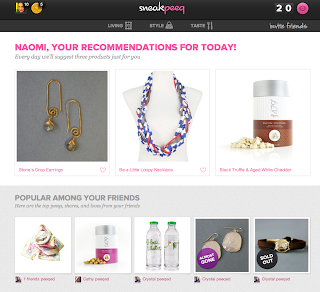 sneakpeeq is the largest social shopping company on Facebook, with over 300K users and more joining every day. They offer amazing daily deals from over 600 partners from your favorite fashion/home decor/gourmet food brands and are fully integrated into the FB platform, so you can instantly share what you're looking at with all of your friends. sneakpeeq is offering 20% off your next purchase just for entering, plus one lucky winner will receive a $20 gift card to use on their favorite food, style and home products from sneakpeeq’s curated bargain boutiques! Enter the giveaway following the instructions in the form below. YOU MUST JOIN SNEAKPEEQ VIA THE LINK SPECIFIED TO ENTER!!! The winner will be randomly-selected on February 29th. In accordance to the FTC Guidelines and the WOMMA Code of Ethics, I am disclosing that I will receive a gift code to facilitate this giveaway. All opinions are, as usual, strictly my own. Hard to narrow down my favorite deal, but I'm drooling over the food. Just recently learned about Sneakpeeq and I'm excited to get those emails! I "Like" the "Wild Weaves Hobo!"